if you didn't make it to the shop for the opening or live miles away, here's your chance to watch 'the making of the bookshop' video. This is now avaiable on Youtube, and many thanks to Martin Deutsch for the brilliant editing of this. It's been a good week, and we're beginning to reap the benefit of some of our advertising and marketing. 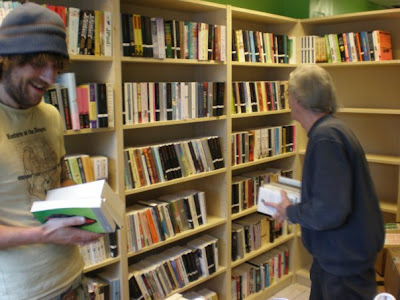 It's very reassuring to be greeted with customers who are so happy that there's a bookshop in Wood Green again. 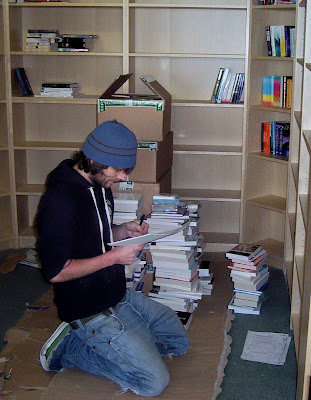 One of the biggest things going for us is the ability to get books within 24 hours. Now we're set up with Bertrams and Gardners (the two biggest wholesalers in the country), our access to titles quickly amazes and delights our customers. It's always confused me that Waterstones and no doubt the other chains discourage the shops from using the wholesalers, who offer next day delivery, in favour of going direct to the publishers, where the shops couldn't guarantee a book being delivered in less than a week. Obviously going direct to the publishers gives the bookshop a bigger profit margin (2-5% usually), but in a hugely competitive world, where the internet is a massive rescource, speed of delivery is so important to the customer. In my expereince 95% of customers who are quoted '10 days to 2 weeks' for a book to arrive would say no way. I reckon that we get at least a 50% hit rate when we can offer 2 days at the most. Anyway Waterstone's, at least, will have their own warehouse soon, so in effect they'll be their own distributors. I wonder if they'll be able to offer the same speed of service as Bertrams and Gardners. And if so, I wonder if we can open an account with them?? Big Green Wednesday is coming along nicely, and we've managed to get some great authors to agree to be part of it. We're also trying to organise a 'Crime Week' in Wood Green. 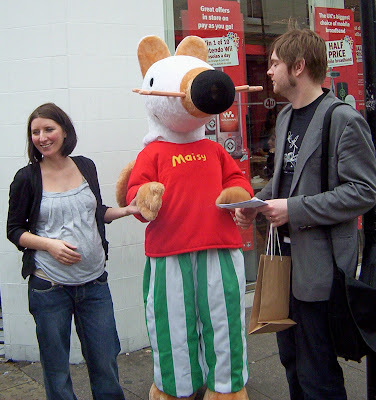 Yes, yes, 'every week's crime week in Wood Green' very funny. What I mean is having a festival of events and authors in sometime in June all related to crime fiction. So far things look great, and we have half a dozen well known uthors who've said they'd like to take part. Also i'm especially looking forward to the murder mystery evening we're going to have in the shop. The reading group is proving very popular, and after a couple of requests we're going to start a kids reading group as well. It's aimed at kids between 9 and 13 who love books and love talking about books, and I reckon it'll be good fun. We're going to do it on Sunday morning at 11am (before the shop opens), but we won't be serving wine. Sorry if you enjoyed it, but the public has spoken and that's that. we're selling it for a fiver, and it's going very nicely. I've reviewed this book on this here blog before, and I think it'll make for interesting discusion at the group. We also have a suggestion box in the shop (I suspect you've guessed it's labelled The Big Green Suggestion Box) and we've had a few ideas already. The main one is to have a poetry section. At the moment we've got poetry, essays and plays in with fiction. The reason for this was that we hoped people would be doing the usual thing of looking through fiction and would find a book of poetry 'by mistake'. It's worked well on some occasions, and I doubt we'd have sold 3 copies of Tarantula by Bob Dylan, if it had been in the poetry section, but at the same time we've uncovered a large population of local poets who are up in arms (exageration) about this. So we've caved in. And now we've arranged for an evening of poetry to be performed in the shop! What a turnaround. Talking of events, we have 2 book launches arranged for the end of April and the beginning of May, and also we've got 3 more author events sorted out for the next couple of months. We have our first newsletter going out at the end of the week, so i'm going to try and get a couple more sorted by the time that goes to print. I had every intention of taking some snaps of the shop for the blog, but the batteries in my camera have given up, so I must sort that out soon. The shop still smells new, but it's beginning to look a bit more lived in. I wish the weather had given us a bit of a break recently. Since we opened the temperature has been hovering between 1 and 6 degrees, and we've had howling gales, pouring rain, sleet and snow. It was lovely yesterday (of course we were closed that day). I'll try and keep this a bit more regular, but I hope you understand we've been a bit focussed on the shop'n'stuff. 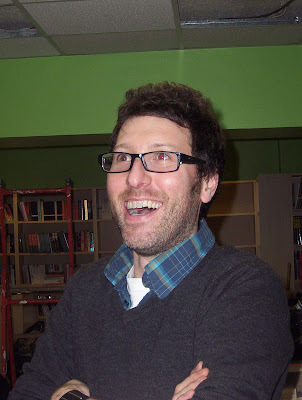 we're going to be trying something in the shop, and this is the thing that we're going to be trying in the shop. We're going to open on a Wednesday at 10.30am instead of the usual 9.30am . Can I stress at this juncture that this isn't because we fancy a lie in midweek (although it would be nice), but because we're going to invite a class from a local school to come to the shop at 9.30am each Wednesday, and get an author in to entertain them for an hour. We're going to start this after the easter holidays, at the start of May, and so far we've had lots of lovely authors who've signed up to the thing wot we're calling 'Green Wednesday', although it might change to 'Big Green Wednesday', depending on how we're feeling. 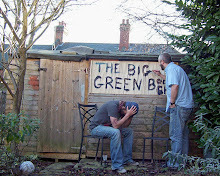 If you (yes you), are in a position where you can help us to get some authors in for this thing, or if you are, in fact, an author who'd like to join us, or have some suggestions for Big Green Wednesday, then you know the procedure. It was a miserable day today in our shop, but we have to have a few of them I guess. 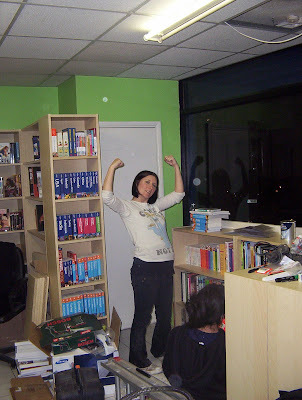 But we did get our first account order, and it's only day 10, and (here's the best bit), it's our shop! Maybe tomorrow ( a song you're likely never to hear on this blog again) will be better. So vote for "Thank You for the Music" so that you can hear "Silence is Golden"
Kleenex at the ready 'cos here are the lyrics to "Silence is Golden"
I have a day off. So what shall I do? Go into the shop on the pretence that I thought Tim might not have any milk. Go through April and May's new titles to make sure that we have all we need. write 5 reviews for the shop. 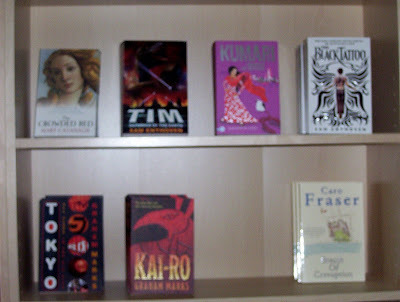 put an order together for more graphic novels, poetry and history. order craft stuff for next Saturday's Easter Eggstravaganza from e-bay. BTW yesterday was another great day in the shop (as Mark from Mostly Books would describe it 'a four figures on the till' day), and long may it continue. It's Saturday, and i'm up early and looking forward to going to work. My head's full of ideas, and and I can't wait to get started. Katie's got a week off work, so we may have an extra pair of hands if necessary week. Which is a very good thing. Friday was a good day, and I've got a feeling that this bookshop lark might just work. Tim was on the phone at home all morning getting in touch with the local schools, and offering them a service unknown to humankind. It's already produced 3 new accounts, two requests for doing assemblies, and a tabletop sale at a parents evening next week. Not bad for a mornings work. The flyering that we've been doing is beginning to work, and people have been coming in saying they didn't know about the shop until they'd got one through their door. People have been coming in and asking if they can take a bundle of flyers so they can do their streets (this has happened more than a dozen times now), and we're selling books as well. The powerpoint advert that the library is putting on it's plasma screens looks really effective, and that'll 'go live' next week. We we're front page in the local paper on Thursday, and although we'd have liked a bit more information about the shop, it was nice to see our gurning faces staring back at us in the newsagents. We're further down the line with some of the events and author appearances, and hopefully we'll be able to produce our first newsletter in the next fortnight. The mailing list is getting longer, and as soon as we've worked out how to set up outlook on the PC we'll be able to make use of it. Are you an internet cafe? where is the internet cafe? can I do a money transfer here? Can I do copies here? Can you keep an eye on my car in case a traffic warden comes along? It's obviously going to take a bit of time for people to get used to there being a bookshop in Wood Green again, and we need to let as many people know as possible. Despite this blog being as popular as it is, and having a facebook group of nearly 400, and despite being in the local paper for the last 3 weeks, and being on the evening news 3 weeks ago, most of our potential customers have no idea we're here. And we knew this was going to be the case, hence phase 64 of the 'Great Plan'. We're doing a mixture of going back to basics and trying new things to get our name out there. I've posted about 500 flyers through letterboxes yesterday, and I have another 500 to do today. We've persuaded the library (London's 2nd most popular) to let us advertise on there big plasma screen, and Tim's putting together a powerpoint thingy for it today. We're also putting some more signs at the corner of the road we're on with arrows on saying 'Bookshop, this way', having been given permission from the owners of the buildings on the corner. We'll, I'd better get flyering. Tim and I are absolutely out on our feet. 17 days non stop has taken its toll, and despite the incredible fun and frolics of Saturday our health is not....er...healthy. 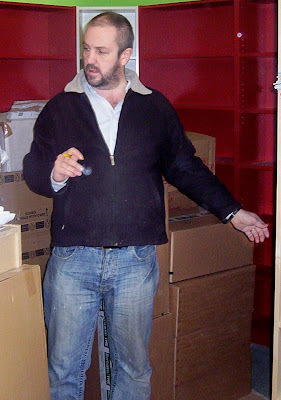 Tim can't lift his left arm above shoulder height after an incident involving bunting, a bookcase, and some ceiling tiles. I have a mixture of a cough a cold and a self pity. A nasty combination. All this coupled with the awful weather hasn't helped. Sunday and Monday have been (obviously) quiet in comparison to Saturday. 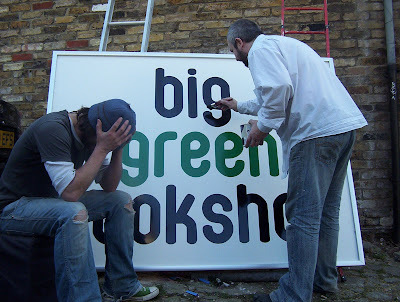 And we've started to implement operation 'being extremely vocal about The Big Green Bookshop in Wood Green'. So far these things have happened. A man called Costas has offered to fix our roof (which is leaking) for less than £150 nicker. 5 local schools have shown interest in opening accounts with us. not a lot to report, but the main thing is that we've started to work on the 99% of people who live in Wood Green who have no idea we exist. I'll be a lot more perky in the next blog (more perky than Michael Perkinson, or maybe more perky than Pinky's partner), but I really need to sleep now. Night night. There are over 100 photos on our facebook group and it's a good place to go to see the full picture of the day. The opening was incredible and really couldn't have gone much better. We sold more than 5% of our stock, which is spectacular. Big sellers in the first day were Hippos Go Berserk, by Sandra Boynton, Michael Foot, by Kenneth O Morgan, Rastamouse and Da Bag-a-Bling, and all the Maisy books, I wonder why? 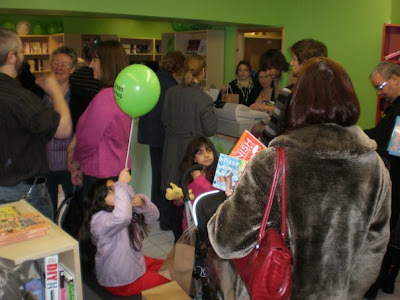 The balloons worked really well and the High Road was full of green and white balloons declaring The Big Green Bookshop, Wood Green's Only Bookshop. We had loads of help all day, and James, Mark, Trish, Amy, Shena, Stuart and Sile deserve loads of thanks. But without a shadow of a doubt Nina Grant was the star of the day. Nina has been a regular visitor/helper/entertainer for us since we got the keys, and she is pretty much the epitome of why we managed to open within 17 days of getting the shop. On friday night I got a text saying that the person who'd agreed to be Maisy Mouse couldn't do it. It wasn't her fault, and I should have phoned her on Wednesday to confirm everything. Anyway, the day before opening we suddenly had no Mouse. I gave Nina a call, and she simply said 'what time do you want me to be there'. She turned up and spent all day in the shop, taking enquiries, learning how to use the till, and most admirably being a fantastic Maisy, enchanting kids and playing the character to perfection. She is an absolute superstar, and we really really appreciate it. Katie was also a legend. She helped throughout the day, and looked after the shop whilst Tim and I flounced around looking bemused. We had visits from lovely lovely authors. Lovely lovely Alis Hawkins , whos book, Testament is quality fiction that will undoubtably be a right old 3 for 2 type title once it gets into paperback. I have a good feeling about this book and hope that the chains see the potential. 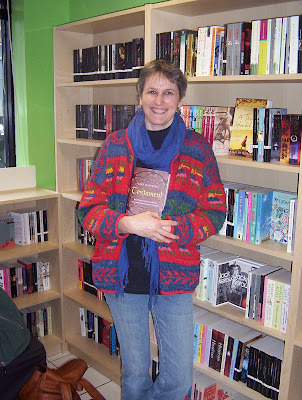 We also had the lovely lovely Sarah Matthias, who's last book the Riddle of the Poisoned Monk I absolutely loved. I have no photos of Graham Marks , who was there to sign 4 of his books. Also Sam Enthoven was there, and I really can't believe there's no snapshot of him, as he's a bundle of energy and fun and got on really well with all the kids that turned up. 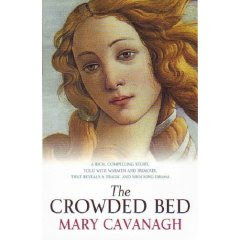 And of course Mary Cavanagh, author of the fabulous 'Crowded Bed'. A Big Green Bookshop seal of approval book. It was lovely to meet her. Her book is a 'belter' and I suggest you read it. 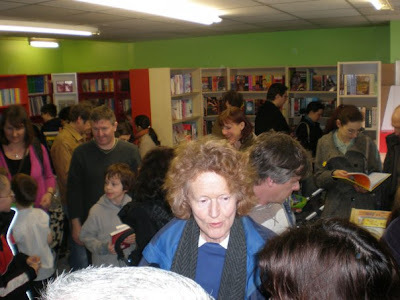 She was accompanied by Caro Fraser, a great crime writer who, like all the previous authors, you should ignore all the links iv'e put and order signed copies through us by emailing enquiries@biggreenbookshop.com . I kind of don't know what else to say. It was mad, and we had the most fun. We know we can't rest on our Johnny Borrels(that's indie rhyming slang), and have huge plans for author events over the next month or two. We're going to visit a load of local schools to do assemblies about our shop, and also we're going to carry on the big plan we have to get our name everywhere in Wood Green. If you're reading this, live local and don't mind flyering your street, feel free to come in and pick some up. 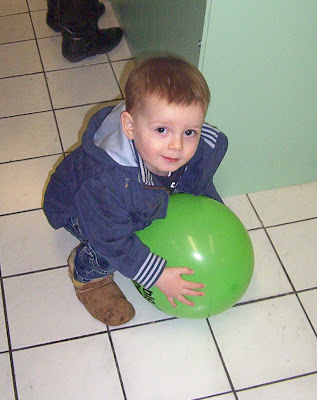 So a new chapter of the blog begins. Open a Bookshop, What Could Possibly Go Wrong still stands. 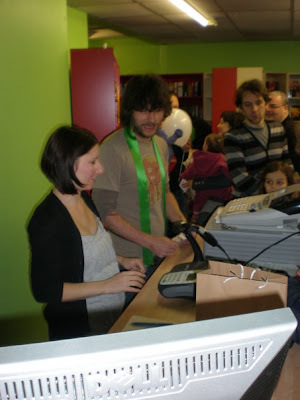 We've opened the bookshop, Now what could posibly go wrong!! Our First customer. Real Fast Food by Nigel Slater. The Mighty Sign (A Mark Farley photo). 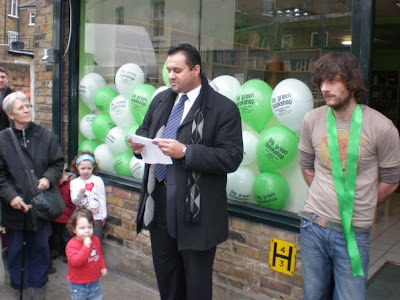 Fiyaz Mughal (lib dem councillor) reading out a statement from Local MP Lynne Featherstone declaring Tim and I gods. Trumpeter's Rosemary Furber and Kate Straw, playing a fanfare, writtten especially for The Big Green Bookshop. More to follow at 7pm, with more words and pictures. Alright, i'll go to work. 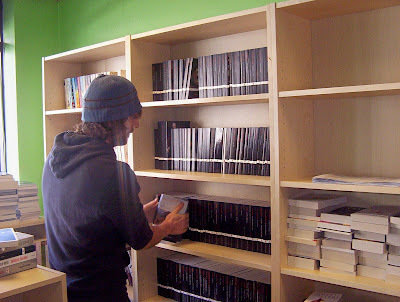 Everything arrived yesterday, and once again, we had lots of people coming in to help. 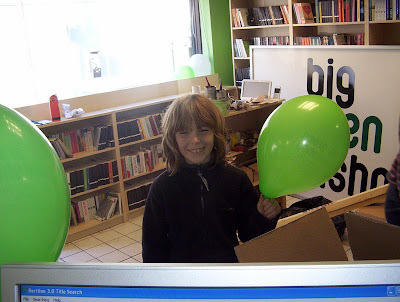 Here's Finn blowing up one of the 1000 balloons that we have, declaring The Big Green Bookshop. Wood Green's Only Bookshop. Thanks Finn, and everyone else who's been in over the last 16 days. You all rock. I'll make it short today, because I need to learn how to use the till, and also I have to get a float sorted. And there are about 34 other things to do on the list, but we should be OK. Here's a picture that we thought you might like.. I'll put a big blog up tomorrow. Fingers crossed eh? To sleep, perchance to dream... I wish I could do more of the first, and less of the second. It's early in the morning and there's some light drizzle going on outside. The weather forecast suggests Maisy Mouse might get a little damp tomorrow (if she arrives today). Still lots to do, but the good news is we finally got the sign yesterday. It's a big one alright, and I think that astronauts will be able to see where we are from space. Now all we've got to do is put it up. Yesterday we had some great help again, and people came in throughout the day to pick up flyers to distribute, help put books out, and obviously bring us chocoalate based treats. James and Clare were both here again. James alphabetasized the Fiction section and Clare as well as shopping, cutting up the flyers (don't by a guillotine form Wilkinson's) started to put the Kids section in some kind of order.No mean feat. , and also were the excuse we needed to get the beers in. Katie made up a hundred goodie bags, which are all filled with delights and treats for kids of all shapes and sizes. 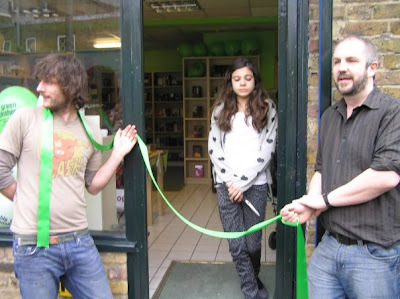 We painted the outside of the shop (dark green), the sticks for the balloons arrived (but not the balloons), the skip is still outside the shop, the oder from the States arrived, and we're now flying solo on the computer, as Marin the Bertam's Trainer has nicked off to spread his teachings elsewhere. 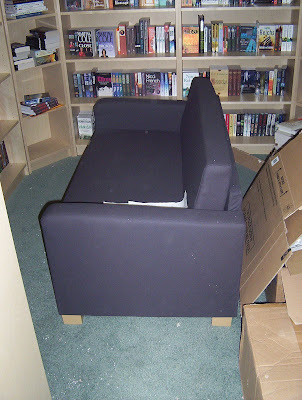 And we've got a sofa It's not green. Lots to do today, and once again thanks for all the messages of support. It makes us smile. Is it Wednesday? I seem to have lost all track of time. And i'm finding it hard to write this, which means I must be tired. Come on Simon, pull yourself together. The Bertram's stock control system is fully installed and seems OK. It's a mixture of systems that we're familiar with and stuff that we'll have to get used to. 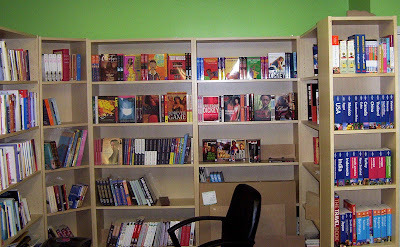 I think we'll be winging it a bit for the first week or twelve, but as long as we can look up books order them and sell them we should be OK.
More books arrived today (red bookcases again?) It seems that the shop's filling up nicely. I've placed a big order with Baker and Taylor (an American Distributor), which will really cheer me up if it arrives before Saturday. But we'll definitely have a full bookshop. There's plenty of room to add to the range. I'd say that we'll be at 2/3rds capacity when we open. We've deliberately made sure that we didn't over order, as we'll have a better idea what to stock once we've opened, and we need some budget to order then. Today was a short one at the shop, and we left at about 7pm. 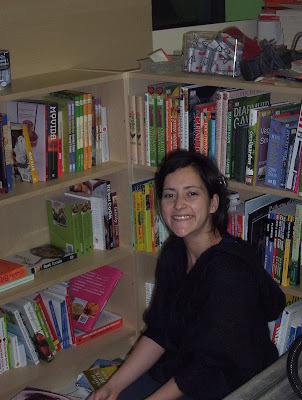 Nina, a previous facebook volunteer came in today to help, as did Claire, who's started putting the kids section in some sort of order. We've printed out the flyers now and we started distributing them already. We reckon we'll get rid of about 5,000 in the next 3 days. That ought to do it. 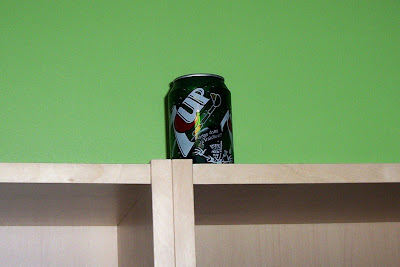 Here's a picture of Tim, with what looks like his head is in a white box. 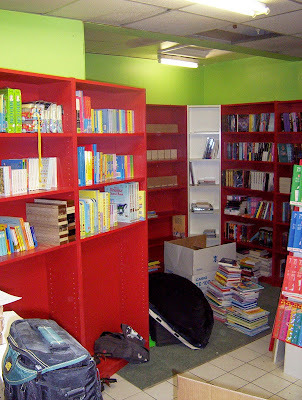 Just so you don't think all the bookcases are red... Oooooh, don't I look busy. I am in fact checking off the Mind Body and Spirit section, which was a real treat, oh yes. 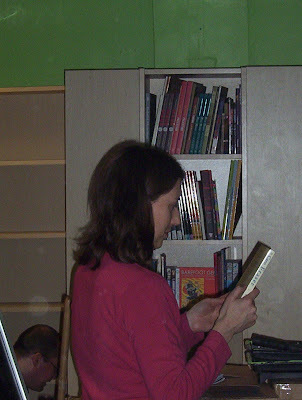 Look Look, here's another picture of me being busy with books This is a lie, as i'm just pretending to look busy. This is a trick that is often used in bookshops, which I have replicated to show how easy it is. 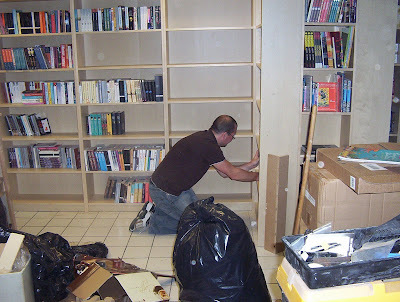 and we're putting together a display bay for the authors who are coming to see us on Saturday. There's lots more to add, but you kind of get the idea. The debit card pin machine (pdq) is 'definitely arriving on Friday'. Tim and I are hanging on in there, and we're taking the last two signs down from the shop front today (there were six signs on the shop last week). Merchandising will be started tomorrow, although it's difficult not to play with all the lovely books that are sitting at vatious angles on the bookcases. It's actually beginning to look like a bookshop now. You'd have hoped with 3 days to go it probably should. 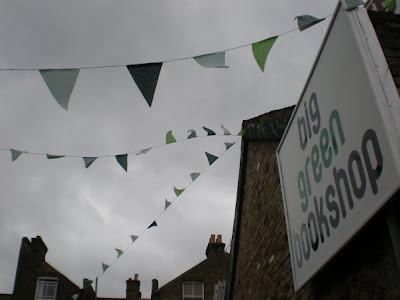 Yes, the Big Green Bookshop will open just 17 days after we got our hands on the keys. 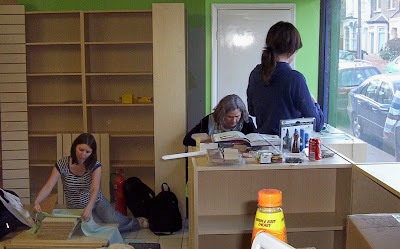 Ten days ago there was an internet cafe at Unit 1, Brampton Park Road, Wood Green, London N22 6BG. But that was then, and we don't plan to sit around like we've had to for the last 4 months as we waited for a bunch of incompetent estate agents and solicitors to do their job. Yesterday was another brilliant day, and our call for help was answered in spades. Bookshop United. 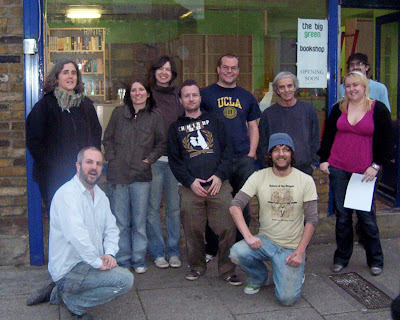 Top Row L-R. Shena Aitkenhead, Katie Chuck, Katie Scarfe, Mark Farley, James Hoddinott, Laurie Owen, Lauren Ace, Neil Wilcock. Bottom Row L-R. Tim West, Simon Key. Not Pictured. Harry West, Julie West, Ewen Brown. 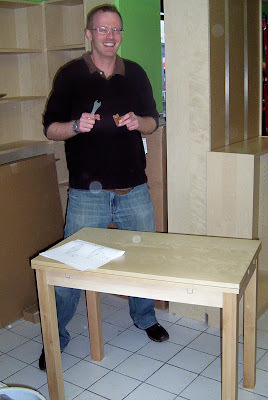 Ewen had a rotten job of putting together stools and a folding table, which he did without a word of complaint, and we really appreciate it. 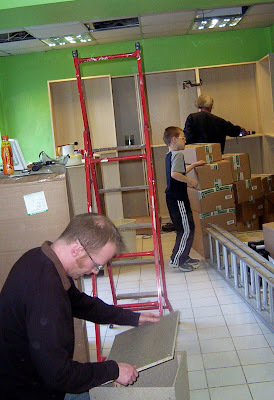 We got in a bit of child labour as you can see, and Harry was very useful getting into those tight corners to finish off the painting. 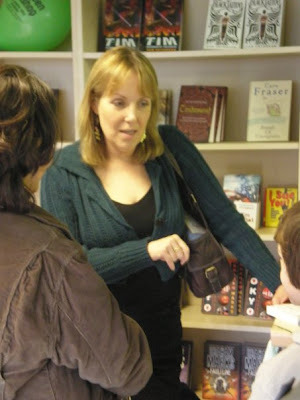 There are some more fantastic photos on Mark Farley's brilliant blog, The Bookseller To The Stars. I hope he won't mind if I nick one, because we finally started getting some books on the shelves and I was so busy checking them off the invoice (it's my money now, so it was even more impportant to make sure all the books were there), that I didn't take any photos. Mmmm, lovely books. We finished the day having checked all of the fiction section, and pretty much all the Science Fiction. It was quite emotional to be honest. My request for a Maisy Mouse costume wearer has also born fruit and we have a couple of people who have said they'd be happy to do it. We've now persuaded 8 authors to make an appearance during the day to sign copies of their books and to generally join in all the fun, and the balloons should be here on Wednesday. The shopsign is due to arrive tomorrow. I hope we don't drop it in our attempt to put it up ourselves. We'll do anything to save a few quid. We've also hopefully got the local paper coming to take some photos, and our (paper) carrier bags should be arriving tomorrow. Lots of kids publishers have been brilliant, and have sent us tons of free stuff to put in goodie bags, and we're finalising games and competitions to keep people amused. We also have had an offer of a fanfare and the like for when our competition winner reveals the shop sign on Saturday at the opening. We're spending today away from the shop. I'm re-doing an order that got lost in the post, and going through the short list of books that Bertram's didn't have form our opening order. I'm also trying to source boks that weren't available from other suppliers as well. I go through stages of panic as the great day gets closer. I've ordered too much, i haven't ordered enough, the books are all wrong, the're's going to be a thunderstorm next saturday, no-one will turn up, the tills won't work, i'll be violently ill and unable to stand up. I imagine this isn't unusual, but it is'nt the most pleasant of feelings. We have a website you can go to it by clicking here. At the moment it's at the development stages, but there's all the info you need for the time being. We'll stick some shiny photos of the shop on there as soon as the shop becomes shiny. Once we've got the opening out of the way we'll be able to spend some more time and money on it. The website is being designed by the talented and amiable Tim a website designer from Brighton, who can grow a fine moustache with considerable ease. Check out his website.